Viktor Orbán has transformed Hungary. So now we know how you do it. I mean how you turn a prosperous 21st-century liberal democracy into an illiberal one, and then into a de facto dictatorship. There are no tanks; no mass arrests of opposition politicians; no coups; no direct assaults on the rule of law; and no new totalizing ideology. There is, in fact, no moment where you can definitively say that the liberal democracy has ceased to exist. But in Hungary, an upstanding member of the European Union, liberal democracy is now dead, pining for the fjords, nailed to the perch, an unmistakably ex-democracy. [Hungary] has now completed a process … that has mostly remained theoretical until now: It was once a liberal democracy. 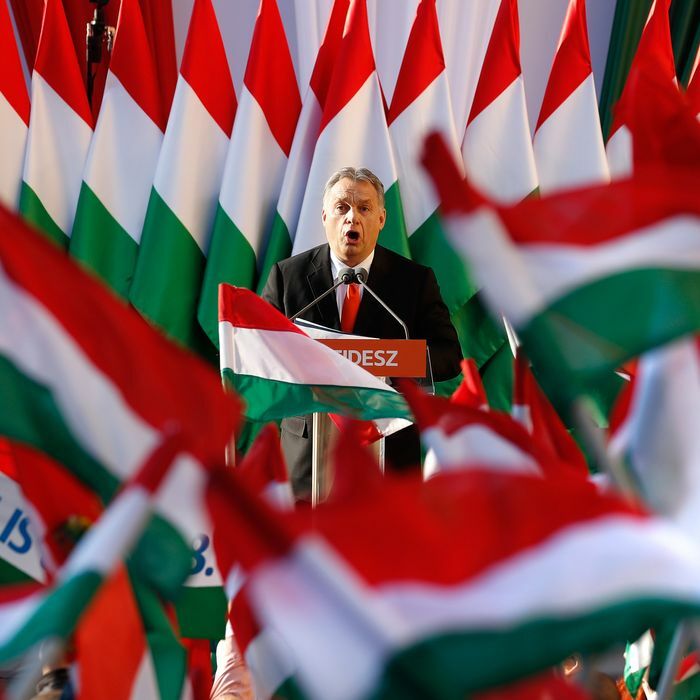 As Orbán undermined the rule of law, dismantled the separation of powers, and massively violated the rights of ethnic minorities, it turned into an illiberal democracy. Now, it is effectively a dictatorship with a thin electoral veneer. We cannot take anything for granted anymore. What was once a theoretical collapse of a liberal democracy now has a proof of principle. Do not ask when this choice between liberalism and illiberalism will come to America. It is already here. The much-anticipated podcast discussion between Sam Harris and Ezra Klein, though frustrating at times, was nonetheless clarifying in one core respect. Klein doesn’t believe you can discuss the latest scientific arguments about genetics, environment, and IQ without integrating an account of the historical and political context that surrounds them. That means, for Ezra, that any contemporary discussion must defer to the context of the history of white supremacy, and its nefarious abuse of science, and thereby be deemed guilty of racism until proven innocent. What Harris is insisting on, in contrast, is that the science is the science regardless of history, and you can discuss that separately from a discussion of social policy or the past, and that, in scientific debate, the race and gender and identity of the participants are irrelevant, and only the arguments matter. This is, in fact, a central question being debated right now in our culture — far beyond the race and IQ debate. Much of the left now holds that structural racism/sexism et al. is so overwhelming that it pollutes the exercise of reason itself. And it further argues that the very premises of debate in a modern democracy — that everyone has an equal voice, regardless of their identity — must therefore be modified to account for these power differentials. And so Harris’s position is flawed because, in Klein’s words, it is simply a reflection of tribal bias, i.e., Harris is a white male, merely defending his privilege, not a free mind grappling with data. Indeed, Klein even believes his own engagement is flawed because he’s white. All thought, in this view, is filtered first through racial and gender power structures. It has no independent realm. “Privilege,” in other words, trumps reason, hence the need to “check it” all times. Indeed, there is no realm in which arguments are simply arguments; they are always to be judged as components of power relations. This is the Frankfurt School made manifest. All discourse is a function of power; and power has to be restructured before any debate can be legitimately had; which means that “diversity” must come before reason; and that suppression of some voices is required for true tolerance and an actual free debate to exist. Hence affirmative action — not to give some disadvantaged but able kids a chance to prove themselves as individual thinkers, regardless of their race, but to resist and overturn the racial power structures that exist on campus, before any truly free discussion can take place at all. Science, for the Frankfurt School, therefore has no real validity as a separate mode of human thought. It is a social construct, like everything else, embedded in “whiteness” and thereby oppressive in its essence. Or to put it in the language of the protesters at Middlebury: “Science has always been used to legitimize racism, sexism, classism, transphobia, ableism, and homophobia, all veiled as rational and fact, and supported by the government and state. In this world today, there is little that is true ‘fact.’” Indeed. Everything is power. And so scientific inquiries that might buttress the status quo must be stigmatized and suppressed, because they presuppose a world in which truth can be posited beyond power. There has to be a space left for reason alone, for a free and open-ended review of evidence and data and arguments, regardless of the consequences, irrespective of the racial and gendered identities of the people trying to think things through. There has to be a space where reason can liberate an individual from his or her identity, rather than a world in which identity is fundamental and creates thought. We once constructed a space in liberal society, where that principle was sacrosanct, where ideas could be exchanged in rare freedom, regardless of who offered them, and debated on their merits. And how many universities will soon be left that have that as their animating idea? Beyond the universities? Our broader intellectual culture — through all the institutions that sustain it — is now being subjected to these same pressures, where race and gender are openly made central to the project of reporting, of thinking, and of writing. Resisting this tendency is not racist or sexist. It is about defending the possibility of a place where ideas matter more than identity. And then they came for Apu. In battling against the relentless onslaught of “social justice,” you have to take solace in a few small acts of defiance. And last week, we had one, as the writers of The Simpsons stood their ground against the attempt to rid their show of funny stereotypes, in particular to reform and remake the character of Apu Nahasapeemapetilon. The usual arguments have been made: Apu foments racism because he was long the sole South Asian figure in mainstream television and does not represent many Indian-Americans, he is voiced by a white (i.e., Jewish) man in a parody of an Indian accent, he “hurts” people, he’s created by people with “privilege,” the oppression is intolerable, yada yada. We haven’t yet gotten to the point in the formula where Apu is actually responsible for the deaths of Indian-Americans, but I’m sure that’s coming. And, yes, on cue, Twitter erupted. The one objection to the scene that had a point, it seems to me, is that Lisa is the wrong character to say this. By 2018, surely her do-goody, NPR-listening, 1998, liberal egghead persona would have morphed into a permanently aggrieved racial activist, intent on removing every lamentable obstacle on the march toward boundless diversity. But maybe Lisa, I like to think, is too smart for that (as are many liberals in private). Maybe she’s precisely the right person to push back against the left’s latest attempt to police and stymie artists and writers. More to the point, Apu is funny, in part, because he is a stereotype, and because that stereotype largely rings true. He’s a first-generation immigrant, highly educated with a doctorate in computer science, a small businessman who went through a tortuous immigration journey, and he’s now a successful and integrated part of Springfield. And, indeed, most Indian-Americans are first- or second-generation immigrants, highly educated, often small business owners, high earners, and skew liberal. So Apu is not an outlier here. And his character has developed quirkily over the years: We know he’s vegan, is good friends with Homer, sang in a barbershop quartet, and thinks he is the fifth Beatle. The Simpsons writers have already addressed his being a stereotype by having a scene where his nephew, who speaks in a generic American accent, is embarrassed by him. They finish with a guest appearance from the Italian chef, with a silly mustache and absurdly stereotypical Italian accent. Comedy particularly needs to be defended against ideologues. Humor is the most resilient enemy of zealotry, which is why so many fanatics have tried to ban or police it, from the original Puritans to the new PC Puritans. I recall George Orwell’s line that fascism would never happen in Britain because if the Brits saw soldiers goose-stepping down the street, they’d giggle. He’s onto something. And in an increasingly multiracial and multicultural society, stereotype humor is one of the most benign ways to vent racial or gender or religious tension, without degenerating into dangerous bigotry. Laughter always defuses hatred. It’s a safety valve and a reality check. That is why some on the left are so exercised about it. For their project in remaking the world, it is, indeed, magnificently problematic.